Close to true cyclone performance on a budget. Shop Built Thien Cyclone Separator Lid. Dust Collection pre separator. I have been getting a few questions about the Thien Cyclones I have been building, and figured I would write a quick review of them, and try to answer the questions I see about them..
For starters a Thien Cyclone Separator is NOT a true cyclone, but does operate in a psuedo cycloninc fashion. Meaning the incoming air stream spins around the outside of the vessel / dust bin and drops its load of dust, and larger particles in much the same way as nearly all the other separator lids do. The BIG difference in the Thien is the baffle. The baffle consists of a disk that is sized to the inside diameter of your vessel, with a 240 degree slot cut out of the outside edge to allow dust / debris to drop out of the air stream, the baffle physically interferes with dust, and debris from trying to get back into the air stream going out of the cylinder and up into the DC and in turn the filter. The Thien Cyclone Separator is a do it yourself affair. This is NOT something that is commercially available, although I bet Phil (the inventor) could probably make a pretty penny off of these if he manufactured them and sold them). Phil Thien, the inventor of the baffle / lid maintains a web site complete with discussion forum to give people instructions and advice on building their own Thien Cyclone Separator lid, and Thien Baffle. I actually got to looking into the Thien setup after reading well into Bill Pentz’s materials on dust collection. I am working within a budget, and needed the best bang for my buck. While Bill recommends a Neutral Vane in the inlet ring of the DC to keep the filter clean and your CFM constant. After talking the issue over with several users that have experimented with both, I am convinced that a Neutral Vane, while helpful in putting, and keeping the air stream moving in a cyclonic motion, does NOTHING to prevent scrubbing, and thus, is performs at a far lower level than the Thien system. Keeping budget constraints in mind, I tried following Bill’s advice as best I could, but there were some big areas of deviation, that I simply at this point accept out of lack funds to do otherwise. This has little / nothing to do with the Thien system except for how I built mine as the Thien setup can be scaled up, or down as need be. #1. Why 4” ducting instead of 6”? Simple. Money, and my tools. All of my tools are fitted with either 4”, or 2.5” fittings. There are a HUGE number of problems associated with using 6” in this regard, and I am in no way ready to scale up my dust hoods yet. I would have to either majorly modify, or replace 90% of my equipment, and I am NOT ready to do that. #2. Why a 55 gallon barrel instead of a galvanized trash can? My Shop Vac setup is based on a 20 gallon galvanized trash can. 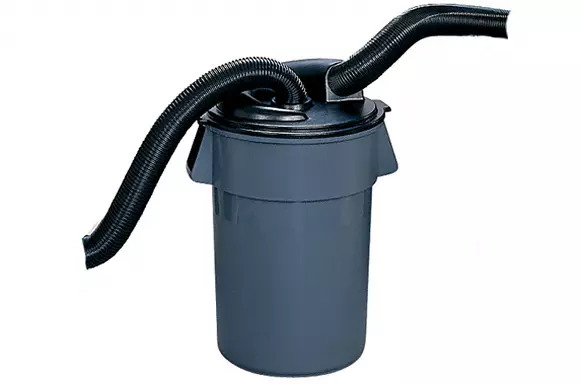 Simply put, it fills up too fast, and the sides tend to want to buckle if the dust port gets plugged by say dropping the hose of the floor… A 55 gallon barrel allows for less frequent emptying of the vessel, as well as a much sturdier vessel resisting buckling. Combine this with the fact that the drum has a buckle / gasket arrangment for an air tight seal, and using the drum and modifying the original lid made perfect sense to me! #3. Why did you use hardboard for the baffle when the instructions show plywood or MDF? Weight. I based my lid off of the relatively soft plastic top of the barrel, and wanted as little weight on the lid as possible. hardboard is inexpensive, lightweight, and quite durable. It was a logical choice for my application. #4. Why use threaded rod instead of dowels for spacers? Ease of use, smaller footprint presented to the airstream. Most of the dowels I have seen in use on these is 1/2” at a minimum. I use 1/4” all thread with fender washers / double nuts. My setup presents less obstruction to the airstream. #5. What would you have liked to have done differently? Used a side inlet instead of the top. I would like to reduce the two bends it requires to get the air stream moving where we want it to. This may be coming in a future rework of this device. #6. What else have you done, or are you doing with your dust collection system to improve efficiency? The biggest thing I did was to immediately take the 5 micron bag OFF of my HF DC, and replace it with a Wynn 35A spun bond poly filter. I know the paper blend filters down lower, but the spun bond can be washed and re-used, and it is at the filtration level I want. I have a strip of foam weatherstripping that is in the notch where the band gizmo for holding the lower bag on is. It seals the bag and keeps dust from blowing out of the place where the plastic bag meets the inlet ring. I am researching options to improve air flow between the impeller and inlet ring. There is a Stovepipe mod, where folks are taking those bendable stove pipe elbows and short pieces of 5” stove pipe to replace the ribbed flex hose in this area that is reported to work exceptionally well. My blast gates are self cleaning models that appear to seal quite well, and I am working to reduce / eliminate any and all tight turns / elbows. Including the flex line from the Thien Cyclone to the DC. #7. Are you going to upgrade from 4” to 6”? I don’t really know. The 4” duct at least APPEARS to be working well for me. I see no hanging dust in the air after I have been working. I think it would take me seeing test results with an air quality meter to convince me 6” is really neccesary. Of course YMMV. I hope this has been helpful, and answers folks questions about this device. If you are running a single stage DC, I highly recommend this addition. It is time, effort, and money well spent! I’ve got my HF dust collector and a trash can. Just have to make up one of these baffles, and get a Wynn 35a and I’ll be set! Excellent! Thanks for the post and all the good information. I made a smaller version of the Thein for a 1.75” hose and it works great. Using an older craftsman shop vac. These are so cheap and simple to make that anyone not able to build a true pentz cyclone should really consider it. Mine only took a half day of actual work. Building on the spur of the moment caused about three trips to the hardware and big boxes. Unfortunately I didn’t have the time or resources to build a true Pentz system or buy a Clear Vue. But so much of what Bill talks about makes complete sense engineering wise. While I disagree with some of his numbers based on things some engineer friends of mine have told me, he is close, and the difference is picking nits and not worth arguing. Bill himself says on his site that this setup (although he recommends a neutral vane instead of a pre separator or internal Thien baffle) is at least workable as a bare minimum. And He is how I found out about the Wynn filter. I must ashamedly admit I was running for a little while with just open doors and a respirator. This was NOT working as the whole garage would have visible dust hanging out for days… My current solution seems to really be working though… My setup is the HF DC / Thien 55 gallon, Ridgid 12 gallon wet / dry vac / HEPA / Thien 20 gallon, and 2 @ 20 inch box fans with the finest filtration filters I could find from 3M / Filtrete at Home Depot duct taped on, and all the way around every opening so as to force the air current through the filters. I am dusting, vacuming, and wet mopping up EVERYTHING that has dust on it. My shop air is visibly cleaner. There seem to be a few of them on the Thien forum that incorporate their own blowers and dust bags too. I’m guessing you could do a whole setup pipes included that would have pro power but entry level cost. I’ve got to get my saw running so I can do one of these myself. I have seen one that intrigued me. The owner did a direct connection from one of those red HF 1 HP DCs straight to the Thien lid, and then out to a 1 micron bag. I would imagine using his design, but a stronger blower using 6”, and a larger impeller, you could build a donut to hold a filter over a small can in the vein of a true cyclone. Wynn carries LOTS of different filter sizes and styles… The 35A is just the one they came out with that is more or less universal fit for hobbyist woodshop single stage upright collectors. WHERE!!! do you guys find the blue barrels with the buckle lid? MAN I need one of those. Baytec Containers in Bacliff Texas 4 miles from my house. The offer reconditioned 55 gallon open head plastic drums which is what I used. No idea what shipping on these is, but I can imagine it would run a few bucks. I am lucky though. Like I said, they are right down the road from me. The walk in prices are lower than on line, and no shipping. Just have to pay sales tax. has anyone compared a thein style baffle with one of the black plastic dust seperators available from rockler/woodcraft/etc? i made a thein style seperator for my vacuum and it works ok but i cant imagine it works that much better then one of the store bought versions. anyone test it out to see? The Thien baffle serves a couple of purposes. Not the least of which is to keep material in the vessel below from getting back into the air stream and in turn getting sucked up into the vac or DC. If you google Thien Cyclone, and follow the links to Phil’s forum, I am pretty sure somebody other than Phil himself has done a comparison test. If you want to compare efficiencies between the two designs, simply make a lid with an inlet on one side, and an outlet on the other and leave out any sort of baffle. The design of the Rockler unit is a simple into the can out of the can at an angle affair, so the incoming debris laden air just goes in and right out of the can without having a chance to unload. I’d show the pics of the ones available from Peachtree, but it’s the same exact thing offered by Rockler and Woodcraft….